It had never occurred to me before now to make gnocchi from pureed carrot; but once I saw this recipe in Domenica Marchetti's book, The Glorious Pasta of Italy I realized that it actually makes sense. The sweet flavor and creamy texture of the carrots is similar to those of sweet potatoes and pumpkin; both of which make excellent gnocchi. In this dish the carrots are roasted to enhance their sweetness and then pureed until fairly smooth. Next the carrots are mixed with ricotta and just enough flour to bring it all together. What makes this dish even more unique is the cooking method. 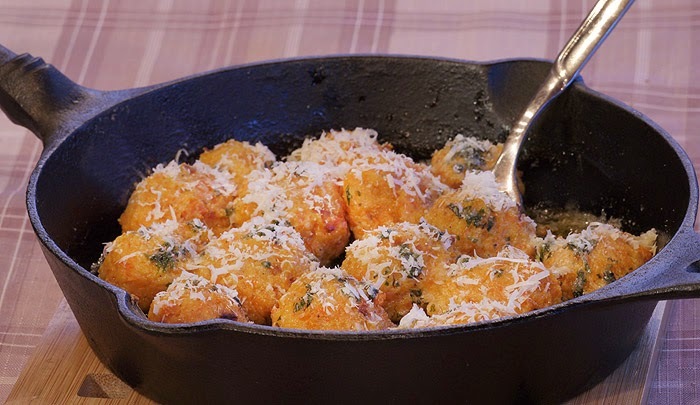 The gnocchi are first boiled in water, then tossed with a browned butter herb sauce and topped with Parmesan cheese before they are put in the oven for a quick bake. The results are phenomenal, when the gnocchi hit your mouth you instantly taste the sweetness of the carrots immediately followed by the bold nuttiness of the melted Parmesan and browned butter mix. Don't let the lengthiness of the recipe fool you; it may be time consuming but it's very easy to make and it's so worth it! Oh and don't forget to scroll down and enter the Whole Foods gift card giveaway below the recipe! To Make the Gnocchi: Heat the oven to 400 degrees F/200 degrees C/gas 6. Place the carrots in a single layer on a rimmed baking sheet/tray or shallow roasting pan/tray, and drizzle 1 tbsp olive oil over them. Sprinkle with a little salt and toss with a spatula. Roast the carrots for 30 to 40 minutes, or until they are completely tender and browned in spots. Remove from the oven and reduce the oven temperature to 375 degrees F/190 degrees C/gas 6. Heat the butter in a frying pan placed over medium heat. When the butter is melted and begins to sizzle, stir in the shallots and sauté, stirring frequently, 4 to 5 minutes, or until they begin to soften. Add the roasted carrots and toss to combine them with the shallots. Remove from the heat and let cool to room temperature. Transfer the carrots to a food processor and process until fairly smooth (a few little bits are good for texture). Scoop out the carrot puree into a bowl. Add the ricotta, egg yolks, Parmigiano, 1/2 tsp salt, the nutmeg, and a few grinds of pepper. Gently stir in the 1/4 cup/30 g flour, taking care to combine everything thoroughly. Place a scoop of flour in a shallow bowl. Have two standard tablespoons at hand. With one spoon, scoop up about 1 tbsp of the carrot mixture and then transfer it to the other spoon. Transfer the mixture back and forth a few times to help shape the mixture into a ball (it does not have to be perfectly round). Gently drop the ball into the bowl of flour and coat it lightly. Then roll the ball between your palms to produce a chestnut-size nugget. Transfer to a lightly floured rimmed baking sheet/tray. Repeat until you have used up all the mixture. You should end up with 32 to 36 gnocchi. To Make the Herbed Butter: Melt the butter in a small frying pan placed over medium-low heat. When the butter is melted and begins to sizzle, stir in the herbs and cook, stirring occasionally, for just a couple of minutes, or until the butter has taken on the flavor of the herbs. Remove from the heat. Spoon some of the herbed butter into a baking dish large enough to hold all the gnocchi in one snug layer. Set the dish near the stove. When the water is boiling, carefully drop half the gnocchi into the pot. Cover the pot until the water returns to a boil, then uncover and cook the gnocchi for about 5 minutes. They will float to the top when they are nearly done. Using a skimmer or a large slotted spoon, remove the gnocchi to the prepared baking dish. Cook the remaining gnocchi in the same way and add them to the baking dish. Drizzle the remaining herbed butter over the gnocchi. Sprinkle the 1/4 cup/55 g Parmigiano over the gnocchi and place in the oven. Bake the gnocchi for about 15 minutes, or until they are hot throughout and the cheese is melted. Serve immediately. Pass additional cheese at the table. This looks absolutely fabulous! I love anything with gnocchi! Thank you for sharing! I think it sounds wonderful! ...and healthy ...and delicious! Love carrots. Follow you on instagram as rusthawk1. What do I think? I think that it's amazing! Love! Sounds intriguing. Shredded carrot added to tomato sauce can add sweetness without sugar. You know what I love about this gnocchi? It's got a HUGE amount of carrots, just a small amount of flour and the ricotta is just fantastic to this Italian girl. I bet they are nice and sweet too from the carrots! This looks awesome and well worth the time spent putting it together! I love gnocchi so much and this looks amazing! I love gnocchi! This recipe sounds very tasty! I love this recipe! I've only made potato gnocchi before, although with flavorings in it but not ricotta. This actually looks like less work and they are so large and fluffy! Gnocchi is may favorite!! I always keep some in the pantry for and easy dinner. Oh my goodness... this just made my stomach growl. What a great idea! I love this idea! Gnocchi is a favorite but it's always so heavy and I usually feel miserably full after eating it. This is such a great way to lighten it up! Since I love carrots, your Gnocchi recipe sounds very interesting and one I would love to try! Oh, WOW!! Never would have even considered carrot gnocchi. Till now!! I love roasted carrots so much. My tummy is growling right now! Gnocchi is probably my one major weakness. I love that you made this version with roasted carrots! My husband looooves gnocchi. I'll definitely have to make this one for him! Oh my goodness, I want this tonight!! I've done gnocchi with potatoes and pumpkin, but never with carrots - great idea! the recipe looks fun, ive never thought of or seen this idea! I've never tried it but I'm always looking for substitutes for pasta! I never would have thought of this either, but it's kind of brilliant! I can just imagine that sweetness. Yum! I've never tried carrot gnocchi but I have had sweet potato gnocchi and it was delicious! I bet this would be equally as good! Love gnocchi so this would be a great way to get more veggies into our diet. Absolutely love carrots. I can't wait to try it! I love this idea. Gnocchi is one of my favorite things, and trying it with carrots, a favorite veggie, is now on the top of my must-make list. this looks great and sounds amazing! I have only made gnocchi with potato so this carrot gnocchi would be so neat to try!! Very creative. I really, really want to try this. Can not wait to try these; sounds so yummy and healthy!! Wow this is really neat. Looks and sound's delicious! I would love to try it. I hav e been enjoying rainbow carrots a lot lately so I think they would make it extra fun! what a great flavor they must have!!! It sounds yummy to me! I looove gnochi but I have never tried it made with carrots and it makes so much sense. I love this idea! Sounds so delish and it is a recipe I would love to try! I love gnocchi so carrot gnocchi sounds wonderful to me. Does this look good or what? I'll bet it tastes fabuloso, too! This is a very well done recipe. I have tried it with beets, carrots and Ricotta. The best recipe ever!